Most of you requested how we created the Most commented widget that shows the list of Top10 most popular posts sorted by comment bubbles. You can see this widget on our sidebar under the heading "Most Discussed". What we did here was using existing script from Yahoo! Pipes that uses json to parse and display each post with highest number of comments posted on it. Using CSS3 pseudo properties, we then styled the comment count with comment bubbles. This widget is simply a copy-paste tool that can be installed within seconds. 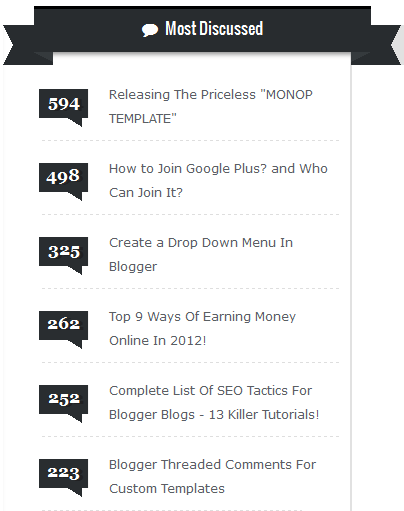 Lets add this dynamic and fast loading widget to your blogger blogs! Replace this 6 with how many post titles you wish to display in the list. To change the background color of the comment bubbles, Simply replace the yellow highlighted hexadecimal color codes ( #292D30 ) with your custom color. To change the Text color of the Comment count Replace #FFF. 5. Save and you are all done!